May 3, 2016 by Ken Ward Jr.
You’ve got to give Democratic presidential candidate Hillary Clinton some credit, I guess. It would have probably been easier — especially at this stage of the campaign — to ignore places like Mingo County, West Virginia. There’s plenty of media coverage already about the Democratic Party’s problems in the coalfields. What’s the upside to basically giving your opposition — not only in the November presidential race, but in races for control of Congress, state legislatures and governor’s offices — a handy pep rally? Maybe the Clinton people have some polling that suggests they have some kind of shot to win here in the general election, though most people who follow such things seem to think otherwise. Maybe, as Sen. Joe Manchin was pitching the last few days, the Clintons really just care about showing their face in places that might otherwise think they’re just being left behind. And maybe the Democrats generally really want to put some force behind the various plans — President Obama has one, so does Secretary Clinton and so does Sen. Bernie Sanders (so do Republicans like Reps. David McKinley and Evan Jenkins, by the way) — to try to deal with some of the coal industry’s massive legacy liabilities as part of a broader effort to find some path forward for communities whose main industry is in a steep decline. It’s good to keep plugging those proposals. The huge financial problems facing the health-care and pension plans of the United Mine Workers of America have to be dealt with for anything good to happen in the coalfields. Finding a way to pump more money from the federal Abandoned Mine Land program to coal-mine cleanups would help improve the environment and public health here, while spurring job creation. But aren’t the Democrats missing something? Shouldn’t they even just once in a while make a larger point that life with coal as your only industry isn’t as rosy as some of the revisionist histories make it sound? Mines blow up. Slurry dams collapse. Workers die a slow, agonizing death from black lung. Pollution of the air, land and water makes people sick. Photo by Daniel Desrochers – Former Massey Energy CEO Don Blankenship stands outside the Hillary Clinton event in Williamson on Monday. 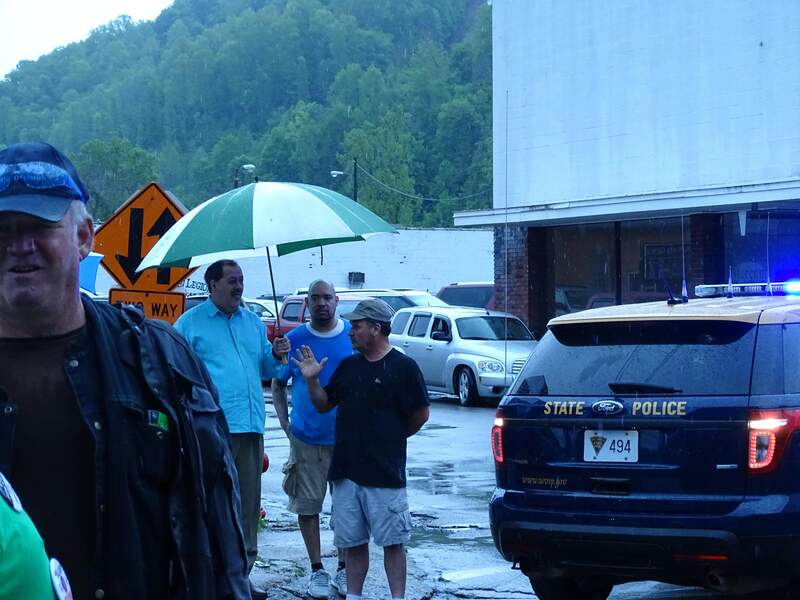 If ever the Democrats needed a symbol of what the downside of the coal industry can do to communities, he was there in Williamson on Monday, standing in the rain right outside Secretary Clinton’s event, with the rest of the protesters. It’s true that both Secretary Clinton and Sen. Manchin have come out for a federal law to toughen the penalties for mine safety crimes of the sort that Don Blankenship was convicted of. 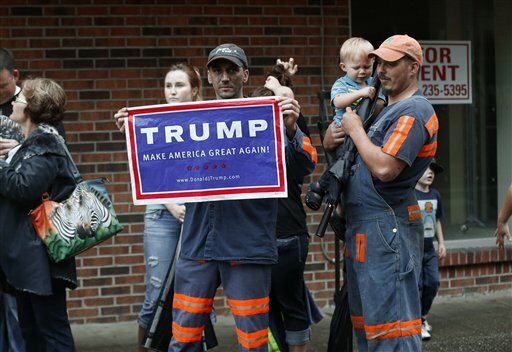 But it is also true that the Democrats went to coal country not with a message about the downside of coal. The message is more about insisting that there’s no real intent to hurt coal, but that a transition to cleaner energy is coming, and the Democrats have a plan to help the coalfields adapt. That’s great. But somewhere in there, if they expect anyone to buy any of that, they’ve also got to make the case for why a clean energy transition is necessary. For one thing, that means they have to actually talk about — sit down now — climate change. If Secretary Clinton’s gaffe about coal jobs showed anything, it was a total inability to even try to sell this policy to the people whose jobs might be affected. Of course, this is all by design. Like much of the presidential campaign — so much of politics, period — Sunday’s event in Logan and Monday’s in Williamson were all theater. Visits by both Clintons were carefully orchestrated. The press got to see just enough to do a story. Participants were carefully chosen — even the part where a laid-off miner gets to ask Secretary Clinton why she’s trying to put him out of a job. That’s all just part of the script. The other side was theater, too, though. Those protesters didn’t just show up on their own. Two coal industry groups — Friends of Coal and Citizens for Coal — were hard at work encouraging their folks to turn out. If you paid attention, you could hear their soundbites coming from the protesters. Citizens for Coal, for example, urged people to say the region’s terrible drug abuse problem is caused strictly by the downturn in coal mining jobs. 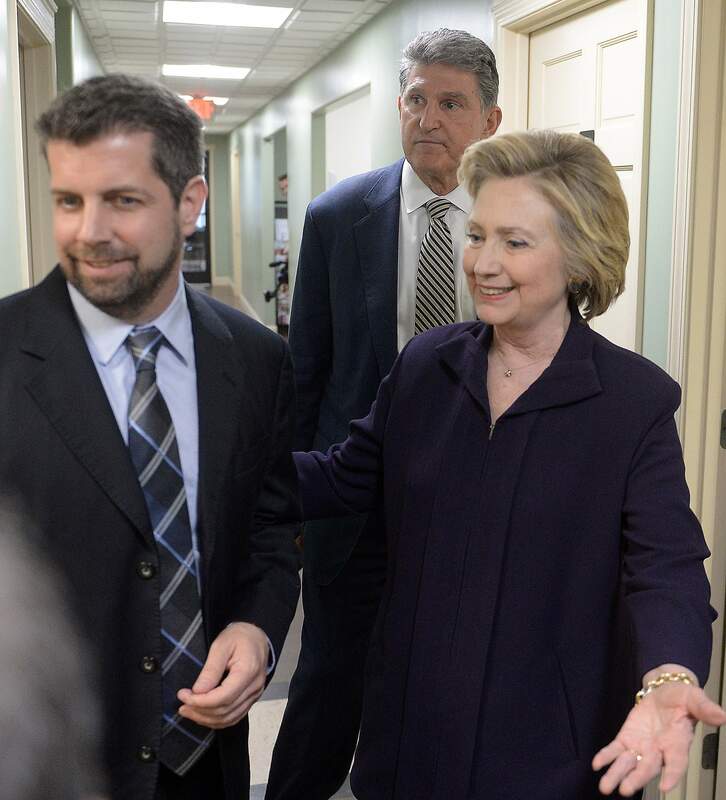 Photo by F. Brian Ferguson – CEO of the Williamson Wellness Center Christopher Beckett, Hillary Clinton and Sen. Joe Manchin tour the Williamson Wellness center on Monday during her trip to Williamson. One thing that somehow got glossed over in all of this theater was the curious and well-publicized connections between one of Secretary Clinton’s hosts — Dr. C. Donovan Beckett — and Blankenship and some of the major figures in Mingo County’s recent political corruption scandals. Back when residents were suing Massey over water contamination in the Rawl area, Dr Beckett’s name surfaced in connection with an effort to have corrupt Judge Michael Thornsbury thrown off the case because of a complex web of business connections involving Thornsbury, Massey and Beckett (see here and here). Dr. Beckett — he used to be known as “Dino,” but the Clinton campaign was calling him “Christopher” — has been rightly praised for his work on crucial public health issues in his community. More recently, though, he was in the news when he joined those who were asking U.S. District Judge Irene Berger to go easy on Blankenship. What’s that got to do with anything? Well, it’s just another example of how underlying issues are masked by political theater. Everybody was playing their role these last couple of days: The Clintons were the tough but earnest politicians, willing to face their opponents in the heart of enemy territory. Sen. Manchin was the local leader, standing with his party and his friends, risking a lot to make the Democrats’ case. Dr. Beckett was the local boy who stayed home to make a difference, showing the politicians not just the problems, but perhaps some of the solutions. The protesters — with clear directions from the industry lobby — were the angry miners whose communities have been ravaged and left behind. The actors all played their roles. They were easy to fit into. But if you look too closely, things don’t quite line up. The problems in places like Mingo County didn’t just magically appear eight years ago. They won’t be solved overnight no matter who wins the election in November. Donald Trump can’t instantly bring on another coal boom. Hillary Clinton can’t snap her fingers and turn federal money into prosperity. And if West Virginians don’t find a way to break out of their traditional roles in this big political play, things are just going to get worse. To be fair, some democrats are speaking to the monoeconomy in Appalachia, like Sellus Wilder in KY. Chris Regan, vice chair of the WV Dems said at the Sanders Rally in Huntington “if coal by itself was going to save us, it would have done it by now.” Great work as usual, Ken. As of last October four thousand miners had lost their job since 2012 in West Virginia, with more jobs lost since this data was released. And this doesn’t include those outside support jobs, vendors,sales etc.lNo matter what the reason or what one wants to believe or blame for coals decline, these job losses are devastating not only to these families but to the economy of communities and to the state. Hillary Clintons comments about coal and miners really was as thoughtless as any I have ever heard. A kick in the teeth to miners already down. She will not carry WV in the general election because of what she said. She is clueless and ignorant of a region of the country she may very well need come November. lets not forget the railroaders, the schools and the teachers this effects, the mom and pop stores close to the mines, the truck drivers that hauled the coal etc. It’s quite clear that until folks in the coalfields (and elsewhere) fully grasp the global urgency to address climate change and move toward cleaner energy, they are going to continue to see this as an assault on their livelihoods. If I didn’t grasp the desperate need to address climate change, I would be mad as hell too. I am the Chris Steele in your photo and I was not playing any role or asked by any group to attend and protest. I showed up on my own to stand up for my job and my Christian beliefs. By “folks in the coal fields” Ted do you mean the laid off coal workers? Or the operators? Coal companies no longer hold power. They are almost all bankrupt. Your side won Ted. Coal is no longer a viable job producer or the top energy producer. It doesn’t really matter what coal miners think or believe about climate change. Would grasping or believing make it any easier? Instead of trying to making more people aware of climate change Tim, maybe you could lobby for a better buisness environment for new clean energy companies, because I don’t see clean energy companies knocking the doors down to get in our state. For that matter, I don’t see any company wanting to come in to WV at this time. Will these clean energy companies even want to come to a state where they see a legislature come together to raise taxes just to keep the state open? All I see is county school systems laying off employees because of dwindling student numbers. All I see are young couples leaving to find work in other states. But I guess we can just blame that on those bad coal operators and laid off miners too. Ken Ward, Jr. , you should live in Mingo County among the people that you easily dismiss as followers instead of desperate people who are standing up for themselves and their way of life. If what has been done to any other group of minority Americans that has been done to this minority of Appalachian Americans there would be not be the peaceful, respect for the law kind of protest that you saw in Williamson by my law abiding fellow Mingo Countians, but the violent protests you see in this country when a group is “offended” by the cause celebre of the day. Drug abuse (as well as alcoholism) occurs in places where people are hopeless and desperate. The drug abuse in our area is a direct result of the joblessness and hopelessness of our people. It takes a bitter toll on a strong hardworking coal miner to be unable to provide for his family. Ken Ward, Jr., take off those green colored glasses through which you see us and come on down to Mingo County and live among us for six months, not as a reporter with a point of view, but as a man with no job and little hope in a community of men and women that are suffering that same fate. You are so entrenched in your green beliefs and hatred for coal that you refuse to see the reality of my people. Their lives have been destroyed by the policies that have swept their livelihoods away like dust in the wind. Without coal mining jobs, every other sector of our economy and lives have been hurt. Our people in Williamson protested in a law-abiding, respectful manner against politicians who have harmed them and their way of life. I am so proud of them. You show little respect for them and little regard for the truth in stating that they were organized instead of what they really are – people who are standing up for themselves. It is a shame that through those green glasses of yours that you can’t see the difference. By the way, do you happen to have a coal tattoo? Three generations of my family do. But the question you raise, really, is how to make men and women whose lives have depended on mining coal understand that the future of humanity depends on dealing with climate change. I don’t have an easy answer to your question. However, I think it takes a lot educating about the costs and benefits of the coal industry and about how we can come together as a community to transform and rebuild our state’s economy. Change is never easy. And there are not a lot of case studies on successful transition (Whales?). This transition will also need strong leadership at all levels and sound policy. The true believers hold no answers.